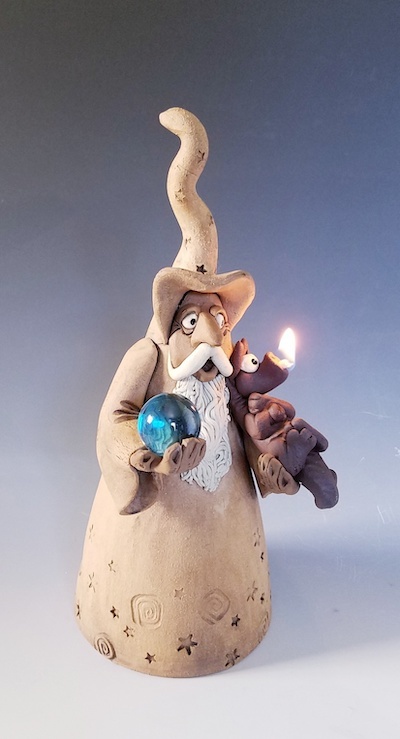 This 9" tall wizard is holding a flaming dragling in his arm. The fiberglass wick is in the dragling's mouth. Lamp oil is added through a corked hole in Finwick's back. He is glazed inside to prevent leaking. He holds a 1" glass ball. Available in the stained finish only. 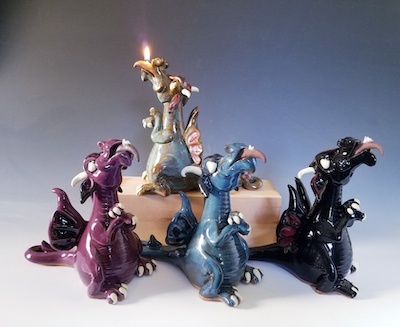 This 5" tall dragon holds a flame on his tongue. Just remove the tongue to pour lamp oil down his throat. He burns about 4 hours per filling. Available in stained, blue, green, purple, or black glazes. 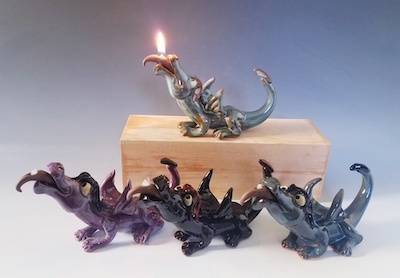 This 8" tall fire-breathing dragon has a fatter body to hold enough lamp oil to burn about 24 hours. The tongue is the holder for the fiberglass wick and the stopper to remove for adding lamp oil. He comes in stained, blue, green, purple, or black glazes.